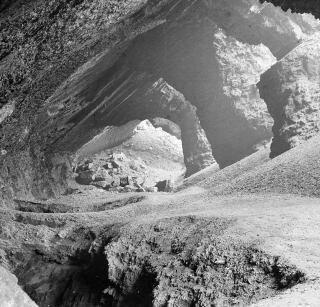 The centre piece of the Black Country Consortium’s submission to the Big Lottery Fund is the re-opening of the man made limestone caverns under the Wren’s Nest National Nature Reserve. A proposed new entrance would be through the Seven Sisters openings. On October 15th 2007 the six short-listed national projects were reduced to four by the Fund’s committee. The good news was that the Black Country Urban Park was one of the finalists! In November programmes on ITV feature the finalists. And a phone poll in the first few days of December will determine the top scheme with a prize of up to £50 million pounds going to the winner. Follow this link to find out more about The People's £50 million Lottery Giveaway. Don't forget to vote on Monday 26 November! A successful Black Country bid would kick start work in Dudley, Sandwell, Walsall and Wolverhampton from ‘green bridge corridors’ to the enhancement of the canals network in a concept styled as an Urban Park. The Society is delighted to learn that Wren’s Nest canals and caves could be show cased through an imaginative set of walkways, lifts and visitor facilities. It is hoped this eye-catching plan will pull in the votes and give the Black Country the opportunity to create an international tourist attraction. The photograph at the top of this piece shows the appearance of the Seven Sisters in the 1930s. Today access is barred by safety fencing and a temporary infill has been carried out to prevent further rock falls and protect the pillars. The Society urges wide public support for the bid. More details about the Black Country Urban Park initiative are available here. John Johnson Shaw was arguably one of Sedgley Manor’s most famous sons. Born in one of the nine villages and educated locally he became a world renowned expert on earthquakes. We asked if you could locate the plaque and give details of his childhood. The plaque can be found in West Bromwich central library. 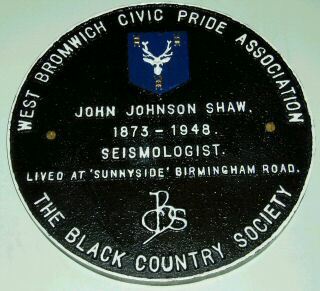 John Johnson Shaw was born at 11 Church Street, Lower Gornal in December 1873. He was baptised at close-by St. James the Great, with his mother’s maiden name as a middle name. He attended Red Hall Junior School and then King Edward VI School, Five Ways, Birmingham. On the 1891 census he is living with his maternal grandmother at 35 Spring Hill, Birmingham and listed as a draughtsman. The Lapworth Museum, on the campus of the University of Birmingham, exhibits Shaw’s original seismograph and holds a large archive of his work.